Classifieds February 28 - March 7, 2018. Call 403-443-5133 or email us at info@threehillscapital.com to place a Classified! Classifieds February 21 - 28, 2018. Call 403-443-5133 or email us at info@threehillscapital.com to place a Classified! Classifieds February 14 - 21, 2018. Call 403-443-5133 or email us at info@threehillscapital.com to place a Classified! Classifieds February 7 - 14, 2018. 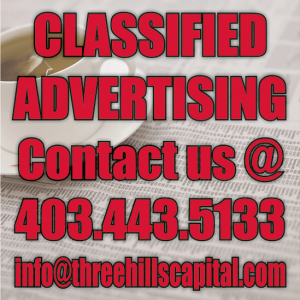 Call 403-443-5133 or email us at info@threehillscapital.com to place a Classified!